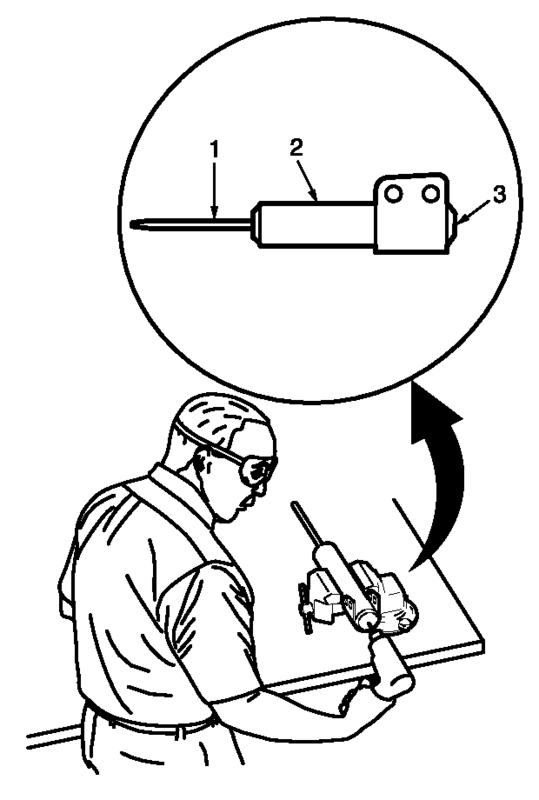 Use the proper eye protection when drilling to prevent metal chips from causing physical injury. Clamp the strut in a vise horizontally with the rod (1) completely extended. Drill a hole in the strut at the center of the end cap (3) using a 5 mm (3/16 in) drill bit. Gas or a gas/oil mixture will exhaust when the drill bit penetrates the strut. Use shop towels in order to contain the escaping oil. Remove the strut from the vise. Hold the strut over a drain pan vertically with the hole down. Move the rod (1) in and out of the tube (2) to completely drain the oil from the strut.